Just one minute from local cuisine and ten minutes from the airport, Fregate Villa houses four bedrooms that sleep up to eight guests. A full kitchen and four bathrooms ensures that friends or family will have the privacy they crave. A quick drive takes you to two neighboring beaches – Marigot or Lorient – or opt for a swim in the large, heated infinity pool. 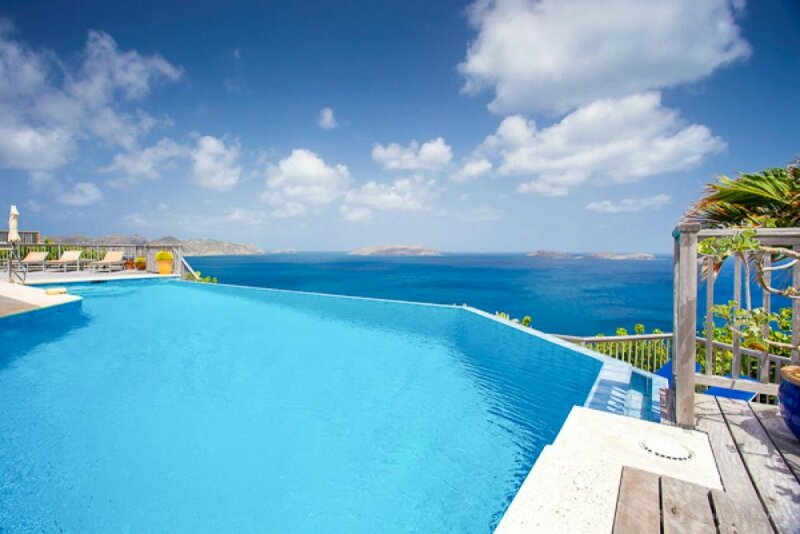 Complete with sunset views each evening, you will fall in love with Fregate Villa! Fregate is a private, cliffside villa at the tip of Pointe Milou, where every room enjoys ocean breezes and great views. Named after a Caribbean seabird, this villa hovers over the ocean with a view that stretches from Saint Jean Bay to islands on the horizon. The expansive terrace is packed with seating and lounging, some shaded and some sunlit. The infinity pool appears to overflow into the sea. Al fresco dining under the covered porch favors sunrise breakfasts and sunset feasts, especially if guests use the stainless steel gas BBQ. The deck leaves plenty of room for entertaining despite the large pool and ample seating. Open to the terrace and view, the living room’s high ceilings and large windows illuminate the villa’s interior. Overstuffed sofas and a flat screen TV create an indoor gathering space, but the computer, printer, and fax machine create a workspace. The well-equipped, spacious kitchen has every gadget, cookware, and appliance necessary for a gourmet meal. The open floor plan leaves plenty of space for friends or family members to cook collectively without feeling cramped. The interior and exterior dining spaces are near enough for guests to easily move if the weather changes during mealtime. Each of the four air-conditioned bedrooms are accessed from the pool terrace. The master bedroom has a king-sized bed, TV, DVD player, a safe and ensuite bath. Right next door is the second bedroom with two twin beds that can be converted into a king, a safe and an ensuite bath. The neighboring third bedroom has a king-sized bed, ensuite bath and a safe. The fourth bedroom is located on the other side of the main living space and has a mini-fridge, queen-sized bed, ensuite bath and a safe. The arrangement of the bedrooms would be equally suitable for a family with older children or a group of friends. Gustavia is a 15 minute drive from Fregate villa, and offers guests shopping and fine dining opportunities. The nearest restaurant is only a minute away, and the nearest bay is calm and steady Lorient Beach. Bedroom 2: Bed can be made in to two twin beds, if preferred. Teenagers Welcome - the house is not suitable for young children.